Joe McGhee was the top Scottish marathon man in 1954 – and rightly so with his gold medal in Vancouver. Little is ever said about the standard at home in the event but if we look at the national rankings for the year we get the following picture. We all know Joe, Emmet is a legend, John won the SAAA Marathon title and Bob Donald is still attending cross country and road races – but Norman Neilson? Who was he? He is still an unknown as far as most Scots are concerned. Three times in the top seven shows that he had some ability! In 1953 he had appeared twice in the rankings with times of 2:43:41 and 2:54:50 for seventh and eleventh places respectively. Alex Wilson, who provided the above picture, contributes the following resume of the man’s career which was quite remarkable. Norman Steven Neilson was born in Govanhill, Glasgow on 12th February 1924. As a youth he competed for Springburn Harriers but lacked competitive opportunities due to the Second World War. By far and away his finest achievement during that period was winning the unofficial Scottish Cross Country Championship of 1942 at Barrachnie, albeit in the absence of many of Scotland’s top cross country men. Neilson is thought to have subsequently moved south to England on service duties. After the war he settled into married life in Hornsea, near Hull in East Yorkshire where he worked as a draughtsman. 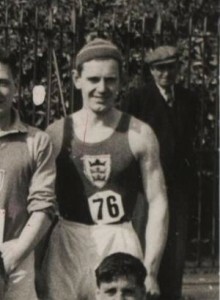 He returned to athletics in the early 1950’s and took up the marathon in 1953, debuting that year in 28th place in the Doncaster to Sheffield Marathon in 2:54:50. Only six weeks after that, he romped to an easy win in the inaugural Hull Harriers Marathon in 2:43:41. With another year’s training behind him, Neilson improved to 2:40:56 for 12th in the Doncaster to Sheffield Marathon on 19th April 1954. A month after that, on 22nd May, he knocked another chunk off his personal best in making a successful defence of his Hull Harriers Marathon title in 2:38:02. The next weekend (!) Neilson returned to his native Glasgow and made a bid for the Scottish Marathon Championship, again representing Springburn Harriers. He, however was no match for Joe McGhee who defied windy conditions to win easily from Emmet Farrell in 2:35:22. But in the circumstances Neilson acquitted himself remarkably well finishing fourth in 2:47:09 only three seconds behind Glenpark’s George King. His running career seems to have come to an abrupt stop at this juncture. Perhaps he had asked too much of his body. Neilson according to his fellow Hull Harrier, Dave MacDonald, then emigrated to Canada with his family. However he returned to England in the late 1950’s, settling in the Blackpool area. The 1954 Scottish Championship was not to be the last word in his running career though for he made another comeback as a vet. In 1972, aged 48, he competed in the National Vets Championship in Derby where he ran second to George Phipps in the M45 1500 in 5:00.3.